Adrants reader Julie writes to tell us, "Right now in Toronto there is this huge print campaign on billboards in the Subway station, on buses, on bus stop huts. 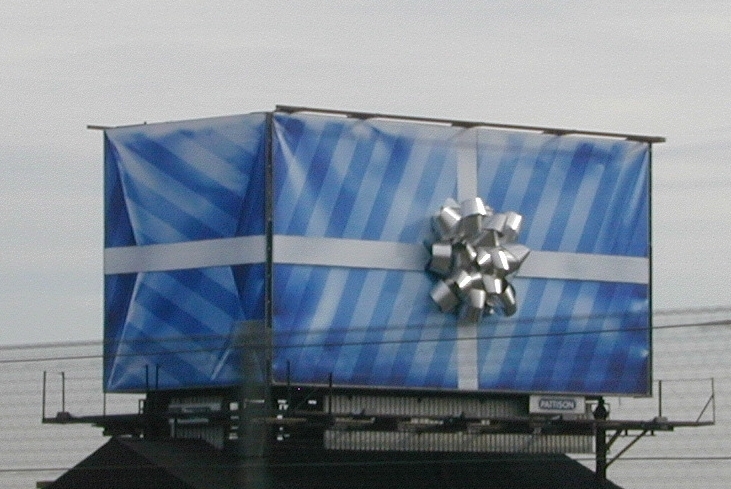 It's just a big blue present with a silver bow taking up the entire space. It doesn't say anything and doesn't have a logo." We love these mysteries. Anyone want to shed some light? UPDATE: There's a debate raging as to whether it's Bell Canad or Yorkdale Mall. UPDATE II: It's definitely Bell Canada. I will venture a guess that this is a Bell Canada campaign. Last Christmas, Bell did something of this scale and in these locations (buses, subway, busstops). The transit ads are all over Toronto. The colour combo doesn't immediately bring any brands to mind, but like Matt said, could be Bell Canada or maybe even Best Buy. Hopefully they follow up with something creative after these teasers and don't leave us hangin'. Seems like it is Bell. Best Buy Canada(direct) says that it is not theirs. It's for Yorkdale Mall...heard it from a friend who works at Yorkdale. it's bell for sure...they had a print ad with the box open and those two beavers (frank and gord i think?) and the box was the same colours, etc. I've seen one in Calgary... I'm pretty sure it's the same wrapping. It just might be Sears. They're doing what seems to be a huge push this season and I've seen the blue present/silver bow theme in their recent TV spots. It's Bell. I just saw an internet ad (with the present)on hotmail. Definitely Bell - confirmed. They will begin to "unrap" the mystery campaign this week.. stay tuned !! !